FELLOWSHIP OF THE RING Assited by a fellowship of heroes, Frodo Baggins plunges into a perilous trek to take the mystical One Ring to Mount Doom so it and its magical power can be destroyed and never possessed by evil Lord Sauron. THE TWO TOWERS Frodo and Samwise press on toward Mordor. Gollum insists on being the guide. Can anyone so corrupted by the ring be trusted? Can Frodo, increasingly under the sway of the ring, even trust himself? RETURN OF THE KING It is time. For Frodo to overcome the wickedness of Gollum, the horrifying attack of colossal arachnid Shelob and the soul-twisting allure of a ring that resists destruction. For Aragorn to take up the sword of his forebears and the crown of his birthright. 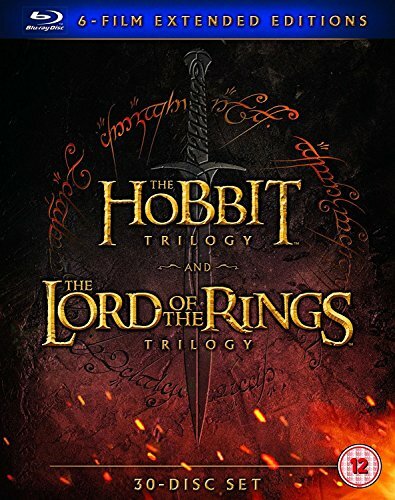 AN UNEXPECTED JOURNEY Follow title character Bilbo Baggins, who - along with the Wizard Gandalf and 13 Dwarves, led by Thorin Oakenshield - is swept into an epic quest to reclaim the lost Dwarf Kingdom of Erebor from the fearsome Dragon Smaug. Along the path, the unassuming Bilbo Baggins not only discovers depths of ingenuity and courage that surprise even himself, he also gains possession of a "precious" ring tied to the fate of all Middle-earth in ways he cannot begin to imagine. THE DESOLATION OF SMAUG They continue their journey to reclaim the Dwarf Kingdom of Erebor. Along the way, they encounter skin-changer Beorn; giant Spiders of Mirkwood; Wood-elves led by Legolas, Tauriel and King Thranduil; and a mysterious Man named Bard, who smuggles them into Lake-town. Finally reaching the Lonely Mountain, they face their greatest danger - the Dragon Smaug. BATTLE OF THE FIVE ARMIES Thorin Oakensheild and the Dwarves of Erebor have reclaimed the vast wealth of their homeland, but now face the consequences of having unleashed the terrifying Dragon Smaug upon Lake-town. Meanwhile, Sauron, the Dark Lord, has sent forth legions of Orcs to attack the Lonely Mountain. If you have any questions about this product by eOne Films Distribution, New Line Home Video, contact us by completing and submitting the form below. If you are looking for a specif part number, please include it with your message.